I’ve made 2 paire of your cuffs. I love the ease and simplicity of your pattern and found your directions right on in every way. Though I consider myself new at crochet I reeeeeallly love it!!!! Thank you for posting something worthwhile doing for free. I appreciate it! Love your website and your heart! I’ve been working on a few spring shawl patterns but yes…..more is coming! I’m interested in this pattern, if you were ever able to re-create it. Thank you! Your patterns are great. They are so easy to follow. Thank you so much for sharing your talent with us. 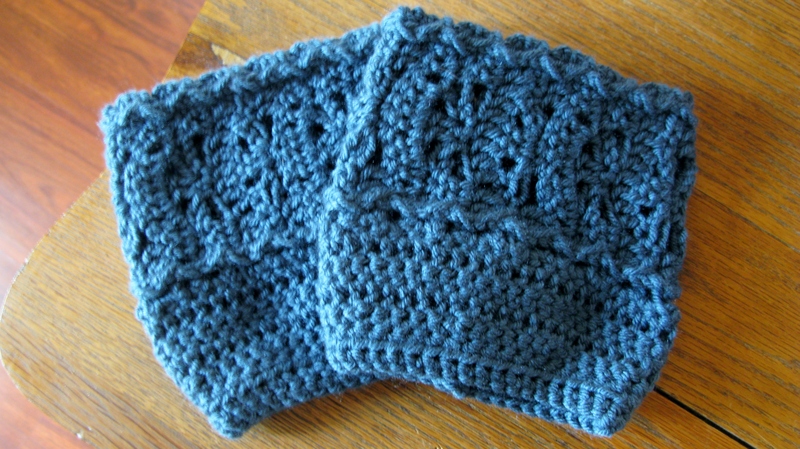 Do you have a written pattern for these beautiful boot cuffs? I haven’t written a pattern for these! Sorry. It’s been so long and I gave them away. I don’t even know if I could re-create them now. I ADORE these cuffs and the ones before! PLEASE post the pattern soon! Thank you for stopping by and leaving me a comment! God Bless! I don’t Mary. I never got around to writing the pattern and have NO idea what I did with my samples. So sorry.